MTA Senior Fellowship Freshman Trip! 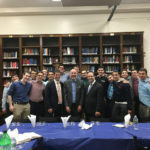 The Julius Wrubel Beis Medrash Katan program provides qualified MTA Seniors with an exceptionally intensive learning experience, thereby transitioning them into the world of Beis Medrash learning in which they will continue to thrive in Eretz Yisrael, at Yeshiva University, and other mekomos ha-Torah thereafter. Talmidim are exposed to the very best of the traditional yeshiva atmosphere and study at a level not often made available to high school students. Talmidim learn in the YU Beis Medrash, where they spend most of their mornings preparing for shiur under the close guidance of Rabbi Tanchum Cohen.